Jesus, if that’s how they treat the second place finisher, I’d hate to be the horse that came in third. Did you catch that? McCain is suggesting that the real reason we are in Iraq is their oil. War for oil is not a surprise to many of us. The surprise is that the likely Republican nominee for President, in effect, admits it. McCain apparently tried clarifying his statement but, as Keith Olbermann and Rachel Maddow point out, there were three different explanations by the end of the day. Of course this war is about the oil. As was the Gulf War in 1991. Yeah…in that earlier war, Saddam Hussein invaded Kuwait first. The Coalition liberated Kuwait under the authority of U.N. Resolution 660. But would the U.S. bother to fight a war over Iraq’s occupation of Kuwait if it didn’t involve “our” oil supply? I mean, if Iraq had invaded and occupied, say, Namibia, would the U.S. respond with military force? Not likely. But Namibia isn’t an oil producing country. No oil…no rush on that illegal occupation. No dead Americans, no dead South Africans. You may well believe that the coalition’s war against Iraq in 1991 was justified by Iraq’s hostile actions and illegal occupation. But don’t fool yourself…when it comes right down to it, the action was about oil. And every time we fill our gas tanks, we purchase a little bit of human blood on the side. Likewise, the U.S. invasion of Iraq in 2003 was not about WMD, terrorism, or human rights. It was about the second largest oil reserves in the world. It’s shockingly refreshing to hear McCain, a powerful Republican, actually fess up to the reason behind our military actions. At the same time, McCain doesn’t seem the least bit bothered by the fraudulent claims made by the Bush administration that misled the Senate and the American people. He doesn’t seem troubled by the heavy toll in human lives (on the order of hundreds of thousands dead) and the untold number of injuries wrought by those lies. Apparently, McCain is just fine with those lies. For McCain, it would seem, political party is thicker than blood. Both Times and P-I readers learned this morning about the sad case of Tim Garon, who died of liver failure a week after being denied a transplant for the third time because of his use of medical marijuana. The dead-tree editions of both papers placed the story front page, top-left, a testament to the newsworthiness of Garon’s death, and the issues it raises. But loyal HA readers have been following this story for weeks, thanks to Lee’s thoughtful and engaging coverage. We first learned of Garon’s plight back on April 22, and it was Lee who broke the news of his death on Thursday. But I don’t bring up the timeliness of Lee’s posts in order to tout a scoop, but rather as an illustration of the relevancy and legitimacy of the brand of advocacy journalism both Lee and I practice. While I share Lee’s general perspective on the utter failure of our “War on Drugs” and its negative impact both at home and abroad, I don’t share his passion for the topic, and I didn’t grant him posting privileges in order to transform HA into one of our state’s most vocal advocates for legalization. But my, um, libertarian approach to the editorial choices of Lee and his fellow co-bloggers has paid off in spades, producing a long series of posts on our drug laws that have generated a coherent and accessible conversation that rivals anything I have read on the subject in the popular press. This is not intended as a knock against the coverage in today’s Times and P-I, except to point out that if the newsrooms at our two dailies had permitted themselves to indulge in a little bit of advocacy — an exercise most “serious” reporters look down on as a journalistic vice — they might have championed Garon’s cause before his death rather than after, thus potentially changing the outcome, or at the very least allowing Garon to die knowing that the publicity surrounding his case might ultimately help to save the lives of others. I’m not arguing that our dailies should have championed Garon’s cause, just that they could have, and that Lee’s urgent and unabashed advocacy was at least as legitimate a journalistic approach to this story as the after-the-fact reporting in today’s Times and P-I. My friends in the legacy media misread me if they think that I believe for a moment that the blogging paradigm is inherently more credible than that which guides their efforts, but I insist that if pursued professionally and honestly blogging can be just as credible, because we wear our bias on our sleeves, not in spite of it. Moreover, while our efforts can be hit or miss, it is our freedom to advocate that often makes the blogosphere more relevant and timely than the daily fare we tend to get from our corporate media. Chris Grygiel at Strange Bedfellows reports on a new Elway poll that looks at the Washington state gubernatorial race. I’ll get to Chris’ odd take on the results below, but first I want to examine the poll in some detail. The poll of 405 people shows Governor Christine Gregoire leading Dino Rossi 43% to 38%. The 5% spread looks to be a small improvement for Gregoire from the 4% spread she had in a mid-April SurveyUSA poll, and definitely better than the 1% spread in the early April SurveyUSA poll and the 1% spread in a late March Rassmussen poll. The current Elway poll results do fall within its margin of error. 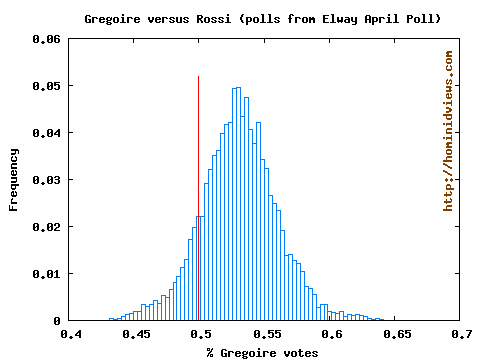 Statistically, this means that the probability of Gregoire beating Rossi is something under 95%, based on what we can tell from a relatively small sample. While it’s easy to dismiss the results as a “statistical tie” (especially when…you know…it’s your candidate who is losing) poll results can be more informative than declaring a “statistical tie.” They allow us to estimate probabilities that Gregoire or Rossi would win in an election held now. The most intuitive way of extracting that information is to use Monte Carlo simulations of elections and simply count the number of Gregoire wins and Rossi wins. I simulated a million gubernatorial elections of 405 voters each election. Each person had a 43% chance of voting for Gregoire, a 38% chance of voting for Rossi, and a 19% chance of voting for neither. Gregoire won 889,889 of the elections, and Rossi took 100,318. In other words, the poll results suggest that, in an election held right now, Gregoire would have an 89.9% of winning the election and Rossi would have a 10.1% chance of winning the election. The area to the right of the red line shows wins for Gregoire and those to the left are wins for Rossi. Chris Grygiel had an interesting take on this race (“Rossi gains on Gregoire in new poll,” reads the headline). He portrays Gregoire as losing ground with this poll, because she did even better in a January Elway poll. But the reality is that numerous polls have been taken since January, and the ground that Gregoire lost happened months ago. A late February Rasmussen poll showed Rossi with a 61% chance of beating Gregoire. That turned around in late March and Early April when polls released by Rasmussen and SurveyUSA each gave Gregoire a 61% chance of beating Rossi. By mid-April, Gregoire was up to an 87% chance of winning an election. Now, in early May, the Elway poll gives Gregoire a 90% probability of winning. Gregoire seems to have momentum on her side…at least, that’s what the recent polls say. The TNT’s Niki Sullivan got a call back from the Rossi campaign, telling her he raised about $625,000 in April, far short of the more than $1 million the Gregoire camp says she’ll report. Rossi’s surrogates had been making a big deal of his relative fundraising success over recent months, but of course that came mostly during the legislative session, when the governor was prohibited by law from raising money. No doubt Rossi will have plenty of cash come November, but I expect Gregoire to expand her money lead from hereon out. Coming up, Darryl applies his typically thorough statistical analysis to the recent Elway Poll, and comes up with a conclusion that may surprise the P-I’s Chris Grygiel. Stay tuned…. Anyone guess what’s wrong with this screenshot from Fox News? Yep, the geniuses on staff at Fox and Friends thought that the ‘Douglas’ in the Lincoln-Douglas debates was Frederick Douglass, the freed slave who went on to become an author and politician, and not Stephen A. Douglas. A new poll suggests that George W. Bush is the most unpopular president in modern American history. “No president has ever had a higher disapproval rating in any CNN or Gallup poll; in fact, this is the first time that any president’s disapproval rating has cracked the 70 percent mark,” said CNN Polling Director Keating Holland. The poll also indicates that support for the war in Iraq has never been lower. Thirty percent of those questioned favored the war while 68 percent opposed the conflict. Gee, I sure hope John McCain keeps running as the candidate who will continue President Bush’s policy in Iraq for another hundred years. I just received word that Timothy Garon passed away this afternoon. I’ve said what I’ve needed to say about what happened to this man. There’s a lot of tragedy in this world, but it’s especially tragic when people who we don’t expect to be among the ranks of the willfully ignorant bring about a result like this. It’s also a reminder for those participating in the 2008 Global Marijuana March on Saturday that there’s still a long way to go. Rossi downplaying April fundraising numbers? I talked to challenger Dino Rossi’s campaign this morning — they tell me they’re also still counting, and that Rossi missed out on some precious fundraising time while he peddled his transportation plan around the state. Is touring the state not fundraising? Was the comment a way to soften the blow of a soft month? I don’t know, but I’ll find out and then tell you all. Well, at the very least it’s an effort to downplay expectations, but I love the fact that Sullivan routinely uses her TNT blog to ask the kind of cynical, connect-the-dots questions typical of, um, bloggers. I sure had my fun at Kirby Wilbur’s expense yesterday, pointing out the rather amusing flaw in the language of the new tax cutting initiative he’s promoting, which ends up slashing property taxes by an astounding 99.4 percent, rather than the mere 30 percent reduction he promised his KVI audience. To be fair, Kirby emailed me to explain that the text of the initiative was written by Floyd Brown and Wynn Cannon, adding “I favored a different approach when asked.” If that different approach includes a revenue-neutral property tax homestead exemption or circuit breaker, I’d be happy to join him in a bipartisan crusade for tax fairness. I genuinely like Kirby, and I think we’d make a great team. That said, I think that the text of Initiative 1030 offers a textbook example of the follies of our initiative process, and of our Republican tax-cutting crusaders in general, for if you don’t understand the difference between, say, an “assessed value” and a “property tax,” then you really have no business rewriting our tax code. For example, while I-1030’s unfortunate miswording may provide the initiative’s most amusing flaw, it is far from its most fatal, for though virtually eliminating the property tax altogether without offering an alternative revenue source would be a public policy disaster, it is not technically unconstitutional. The means by which I-1030’s authors seek to do so however, is. The assessed value of property for all privately owned real property must not exceed the property tax on the same property for the tax year ending December 31, 2008, reduced by thirty percent. The reduction provided in this subsection may not shift property taxes. The regular levies of all taxing districts shall be reduced as necessary to prevent the values exempted under this subsection from resulting in a higher tax rate that would have occurred in the absence of the reduction. Since the “fair value” of different properties rise (or fall) at different rates, I-1030 would immediately violate the uniformity clause, providing an effectively lower tax rate on fast appreciating properties than on those whose fair value has appreciated at a slower rate, or even declined. This is an issue that has already been well adjudicated by the courts, and any serious tax cutter would never have pursued this approach had he done his homework. I-1030 also neglects to note that “real property” consists of both the land value and the improvements upon it (you know, like your house or a 50-story office tower) and thus fails to address the thorny issue of how its provisions apply to new construction. Either new construction is assessed at fair market value while all other property remains at 2008-less-30% levels—a clear violation of the uniformity clause—or, assessed value of all parcels remain frozen in time in perpetuity, regardless of the huge disparity in the value of improvements subsequently made upon them, which is also a, um… clear violation of the uniformity clause. Not to mention, just plain stupid. This kind of amateurish legislative hackery is actually typical of initiatives of this ilk, which explains why so many of Tim Eyman’s measures have ended up being thrown out by the courts. But I-1030 is worthy of fisking despite its laughable language and its fatal congenital defects, because it is crap like this that routinely manages to distort the public debate on property tax reform in the absence of substantive proposals from the Democrats in Olympia. Coming up, I-1030’s authors’ ignorance of our tax system and the laws that govern it is illustrated further by a critique of the initiative from a policy perspective. It is a pattern. Many of his moderate moves turn out to be pretty empty upon closer inspection. In fact, Reichert has reversed his vote on “moderate” bills a whopping 25 times this Congress. Why would a politician expose himself to charges that he was for a bill before he was against it? According to an analysis of House procedure by local blogger Dan Kirkdorffer, Reichert often votes with Republicans on every procedural step for a bill, but if it is headed for passage anyway, he reverses himself on the final vote. The crass objective is to get credit from gullible reporters for backing some Democratic legislation. Take the Democrats’ renewable energy bill. Reichert voted with Republicans to thwart the legislation five times. On Feb. 27, he voted to kill it one last time; when that failed, he turned around on the same day and voted for the final bill, with only 16 other Republicans. These are facts, not opinions, and if our local reporters and columnists want to continue aping Reichert’s campaign propaganda, the least they could do is examine the facts and offer an alternative interpretation before once again touting his supposedly “moderate” voting record. To do otherwise simply serves to deceive the voters of the Eighth Congressional District. Dan Kirkdorffer has been relentlessly pushing his analysis since the 2006 campaign, and while it is heartening to see a professional journalist finally examine the data, it is disappointing that the scrutiny had to come from the D.C. press corps rather than our own backyard. No doubt Dan is at least as partisan as I am, but facts are facts and they stand for themselves.